Oprah Winfrey accepting the Cecil B. DeMille Award at the 75th Annual Golden Globe Awards in Beverly Hills, Calif., on Jan. 7, 2018. Last year certainly had its share of heartbreaks and hurdles. But 2017 was also a watershed moment in the struggle for gender equality, and the reckoning of the #MeToo movement is far from over. The #TimesUp campaign has already set a fierce tone for 2018 and if the Golden Globes was any indication of how the rest of the year will unfold — the future looks female. 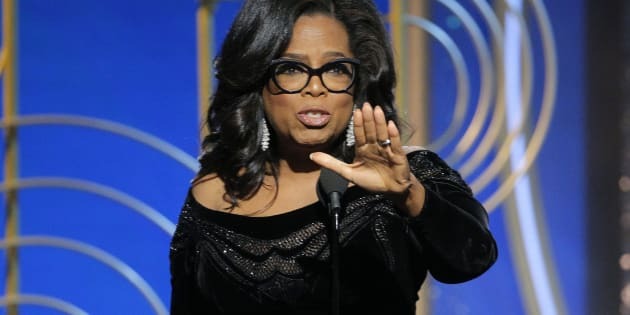 The feeling of the night can best be summed up by Oprah: "So I want all the girls watching here, now, to know that a new day is on the horizon!" So, yes, I have high hopes for what 2018 will bring. But we must remain resolute in our fight. Let's make 2018 the year of acting. You may still be making resolutions for 2018 to inspire personal growth or healthier habits. As you are jotting down goals, don't limit yourself to self-care. Think bigger — think community care. You have the power to help propel the incredible momentum of 2017 into the New Year. To do this, I propose the following five resolutions to add to your list. Youth activists in Timor-Leste take part in march to oppose violence against women and girls. 2017 was a year of awakening. Stories and traumas long buried were unearthed. Finally, the injustices, aggressions and debasement women and girls quietly deal with on a daily basis have been brought to light. We can no longer claim or, as is too often the case, feign ignorance. We know better, now we must do better. Let's make 2018 the year of acting. Acting is not just retweeting or sharing yet another think piece. Acting means taking concrete steps in your life to fight for equality. Action could be running for local government, volunteering at a women's shelter, or even confronting sexist behaviour in your workplace. No matter what your participation looks like, ensure you're contributing to the movement. Try examining your own behaviours and attitudes, no matter how seemingly innocent or inconsequential. Unequal gender relations are so deeply rooted in our daily lives that even the staunchest feminist among us is unwittingly complicit in perpetuating sexist narratives. Try examining your own behaviours and attitudes, no matter how seemingly innocent or inconsequential. Maybe you skip a beat when you see a male kindergarten teacher or a female plumber. Maybe when you see a rambunctious girl, you automatically label her "badly behaved," whereas a similarly rambunctious boy is just "spirited." Don't punish yourself for these views or behaviours, but take a moment to examine where those attitudes stem from and who benefits from their persistence. Barsha, 14, is general secretary of a children's group that aims to build safer cities. Last year, the refrain "Believe Women" was championed as a #MeToo mantra. I think we need to add "Believe Girls" to our marching chants. The experiences of teenage girls in particular are too often dismissed or denigrated due to their age. But adolescent girls are among the most vulnerable individuals in our society. We must take them seriously, amplify their voices and safeguard their human rights. Girls and women are tired of shouldering the burden of gender justice. Men are equal partners in effecting change with equal responsibility. They are also equal beneficiaries of change, as they too are often locked in rigid feedback loops of toxic masculinity and violence. Engaging men in this work does not mean allowing them to crowd out women's voices or take up more space. Rather than viewing men as saviours of women, we must work together as equal partners to topple sexist stereotypes together — not reinforce them. Warrah from Sierra Leone is now back in school thanks to the Girls' Education Challenge. Finally, we must fight for the millions of girls around the world whose fundamental human rights to survival, development, protection and participation in decisions that affect their lives are increasingly under threat. Globally, the world is facing the most severe refugee crises since the Second World War. Out of school and displaced, adolescent girls in crisis are vulnerable to sexual violence, child marriage and early pregnancy. We must rally behind the needs and rights of adolescent girls by calling on world leaders and urging them to make these girls a top priority at the 2018 G7 summit taking place in Quebec this summer. We can't afford to lose the momentum of 2017. And when we encounter setbacks or heartbreaks, as we undoubtedly will, we can again lean on Oprah's wisdom, remembering to "maintain hope for a brighter morning, even during our darkest nights."